Does heavyweight champion Cain Velasquez think he can handle the pressure and bring down best Brazilian heavyweight, Junior Dos Santos? It may have just been two words, but it hit Cain Velasquez like a ton of bricks. "Do nothing." Those were the UFC heavyweight champion's orders from his attending doctors, who knew the seriousness of Velasquez's right shoulder injury: a torn labrum that required surgery and extensive rehabilitation. "It's been hard," Velasquez admits to Fighters Only. "The hardest thing was for the doctor to tell me I couldn't even run. He said that with the bouncing that it could possibly hurt the shoulder again with the vibration of the running and everything. That was definitely the hardest thing - not doing anything at all." For Velasquez, an undefeated 29-year-old UFC champion and former two-time All-American wrestler at Arizona State, the idea seemed incomprehensible. After all, the hallmarks of his five-year MMA career have been an incomparable work ethic and a never-ending cardio tank. Just sit around and wait for things to get better? Velasquez says it was the toughest assignment of his career. However, he also knew rushing back to the gym would provide nothing but trouble. Velasquez admits: "It's been hard to be inactive, but the whole thing that I had in my head was to be safe in order to be healthy. That was it. I knew the less I did, the faster I could come back. That's how I thought about it." The surgery took place in January, and after rest came some extensive rehabilitation on the joint. But the moment doctors finally cleared him for genuine physical activity, the self-professed gym rat was right back at his home base, American Kickboxing Academy in San Jose, California. Velasquez, who relies just as much on his heavy hands as he does his top-caliber wrestling, recalls: "About two or three months after the surgery, we started dealing with a lot of rehab … When I got back in the gym, I was out of shape, but I get in shape pretty quick. The shoulder, it was definitely smaller than my other arm, so I had to get the strength back in that one. The shoulder would get a lot more tired than the other shoulder would. It was just those types of things that we had to deal with, but we kind of expected it coming in." While Velasquez nursed himself back to full health, UFC officials used the champ's downtime to secure him a little media exposure. The often-soft-spoken Velasquez hasn't always commanded a huge press presence, but after thoroughly embarrassing Brock Lesnar last October at UFC 121 and wresting away the UFC's heavyweight title, this budding star suddenly shone in public eyes. Velasquez admits the multitude of interviews - both English and Spanish-language - has at times been overwhelming, but he's quickly learning to handle himself in those situations. "With every fight, it just seems that the more attention I get, the more I get used to it, I guess," Velasquez says. "I just know that it is part of the job, and it's something that I have to do. I'd rather just train and fight rather than doing any other kind of stuff, but I know that doing the media tours and all that is a big part of the sport." But as the media attention increases, Velasquez says he refuses to change. His values were instilled long ago, and he has no desire to stray from his lifelong commitments to hard work and respect. "I try to just be who I am," Velasquez says. "I'm just kind of a quiet person. That's pretty much it. But I know working with the media is part of the job, and I'm definitely going to do it to the best of my abilities." 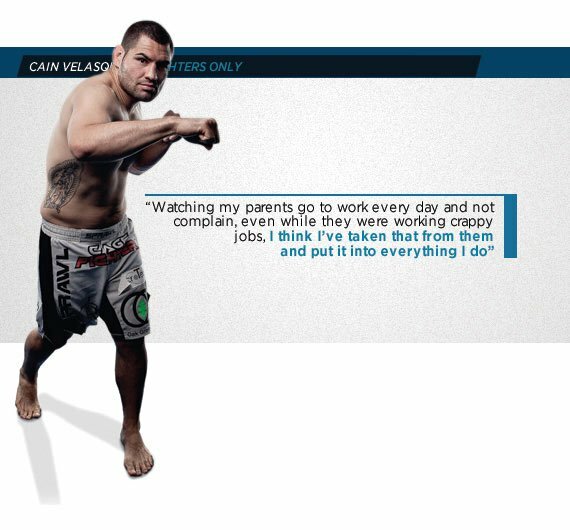 In a nutshell, that's how Velasquez operates in every aspect of his life: whatever you do, make sure you do it as well as you possibly can. It's an attitude he learned from his hard-working Mexican parents and serves as the backbone for Velasquez's vaunted work ethic. "Watching my parents go to work every day and not complain, even while they were working crappy jobs," Velasquez recalls. "I think I've taken that from them and put it into everything I do." It's a respect that Velasquez carries with him each and every time he walks to the cage. Vicente Fernandez's ode to Mexican immigrant workers, "Los Mandados," (The Errands) has been the champ's walkout song of choice since his early UFC days. Velasquez says the song was first meant to honor his father, but as his profile has risen in the Latin community, the track has come to stand for an entire subculture of fans. "At first, it was for my dad," Velasquez says. "A friend of mine chose the song. He found it for me, and I thought it was perfect. The song talks about places in Mexico that my dad actually crossed coming into the U.S. So, it's pretty special, and it definitely started out for my parents. But then people would come up to me and say, 'I've done the same thing. My parents did the same thing.' So, I think it's the perfect choice for a walkout song." And the perfect amount of attention, as far as Velasquez is concerned. He didn't get into MMA to be in front of the cameras, to cut promos, to be billed as a superstar. But if he can provide the youth of both Mexico and the U.S. with a positive role model while also doing exactly what he loves, then so be it. "It's definitely important to me - just being proud of where I come from and where my parents come from," Velasquez says. "Whether or not I'll ever be a superstar, I don't know. We'll just have to wait and see, I guess. I'm not really sure. I'll do the stuff outside of the cage to the best of my abilities, but for me, it's all about training and fighting. "But I know that I have the opportunity to be a role model for some kids. That's definitely important to me. If people can look at me in a positive way, I'm happy to be that person for them." While Velasquez may consider himself a somewhat reluctant superstar, he may soon have little chance of avoiding the spotlight. His 2010 destructions of Lesnar and MMA legend Antonio Rodrigo Nogueira earned him 'Fighter of the Year' honors from respected industry analysts at HDNet's Inside MMA and ESPN's MMA Live, as well as leading websites MMA Fighting, MMA Junkie and Sherdog. Next up on Cain's card is the hard-hitting Junior Dos Santos, whom Velasquez meets for the marquee matchup November 12th for Fox Network's historic UFC event. 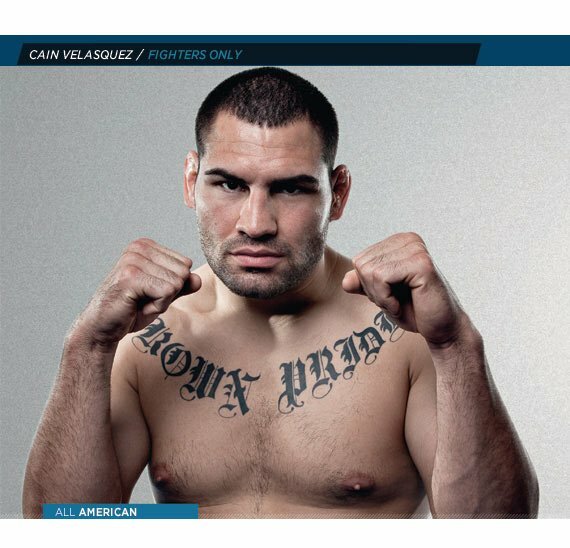 The bout features the consensus top two heavyweights in the world, and another impressive win could catapult Velasquez into brighter limelight and place him at the head of the UFC's run on U.S. network television just as it begins - not to mention solidify his role in the UFC's global expansion. Velasquez realizes the opportunities that lie ahead, but he insists he's not looking past his next challenge. He has ultimate respect for the young Brazilian bomber. "I've watched a lot of his fights," Velasquez says. "I think he's definitely the best at his style of boxing in MMA. He has great technique, a lot of power, good movement. I think with his hands, he's definitely the best striker in the heavyweight division. His technique and his power are impressive. He has a nice uppercut, a good left hook. Just watching his highlights and his past fights, he picks people apart on the feet. I think he's definitely got the best stand-up in the heavyweight division right now. He also has real strong takedown defense, so I think he's a tough guy. He's had some really good fights so far in the UFC." It's a new challenge for Velasquez, who is still perfecting the striking arts. His boxing displays against Lesnar and Nogueira both suggested he's made ample progress, but Velasquez knows he'll have to continue to focus on the stand-up game as he prepares for the Dos Santos. "I wouldn't say I have holes in my game, but I feel like you can always get better," Velasquez says. "That's what I'm trying to do. I'm always trying to improve my technique in every way to get the most power out of my striking I possibly can and trying to get better in my jiu-jitsu game. I feel comfortable on my feet right now, but, of course, with more and more time, I'll get even more comfortable in there. I'll always have to keep working on my technique and improving. I feel like I'm always getting better." A rarity in the modern era of the UFC, Velasquez made his Octagon debut after just two professional fights. Currently, the promotion requires at least three professional fights for anyone even interested in appearing on The Ultimate Fighter. So how did Velasquez squeeze into the UFC's heavyweight division with less than six minutes of professional experience? Truthfully, it was his only option. "I tried to get fights in the small shows," Velasquez says. "After my second fight, I tried to get in some small local shows around California to try and get some ring time, and it just wasn't happening. People would back out of fights. Whole fight cards would go under because there weren't enough fights. We tried. I probably had five opponents back out of fights. The only thing we could do was go into the UFC." So Velasquez's management reached out to UFC brass, who invited the wrestling standout for a rare private workout that served as his official tryout for the promotion and UFC president Dana White. "We went to the UFC gym, and we brought some sparring partners," Velasquez says. "We did some rounds there. Dana saw me spar, and then after that we did some jiu-jitsu. That was pretty much it. We just talked to him for a little bit. He asked why I wasn't in the UFC yet, and he signed me right there. That's how it went. I was nervous going in, but I just did what I knew I could do from my training. I was confident in myself. I was happy with myself after the workout. I knew it was actually going to happen. I've just been building off of that experience, and I'm in a good place right now." To date, the best striker Velasquez has faced is Cheick Kongo, who came up short via unanimous decision in a June 2009 meeting at UFC 99. The fight remains the only bout on Velasquez' résumé that did not end via stoppage. To be fair, Velasquez remained in control throughout the contest, utilizing his superior wrestling to dictate positioning from start to finish. But Kongo had a few impressive moments in the fight, landing a few blows that might have bested a lesser man than the champion. Velasquez, who made the leap into the deep waters of the UFC in just his third professional fight, said that each and every Octagon appearance provides a learning experience for him, but the Kongo fight was especially important to the development of his mental approach. Velasquez says: "I always knew that I had the ability to succeed in the UFC, but I've definitely gained confidence along the way. With every fight I get more confident and more confident. The Cheick Kongo fight was a really big learning experience for me. That was one fight were I hesitated for a split-second on my feet, and I gave him the chance to capitalize on me. Knowing that, I take that into every fight now. I can't hesitate. I have to go." "A lot of times, you can't think too much out there. You've got to just go off of your feel. I learned a lot from that fight. I know I can't hesitate out there or else I'm going to be in big trouble. That's what I took from that. I kind of just take little things from every fight that I've had. I know what I need to work on, and then I just kind of focus on those things on my own in the gym and just kind of keep that in my head." It's an impressive level of self-awareness that would seem only to guarantee that Velasquez has even better days ahead. Even in a near-flawless performance, such as his dismantling of Lesnar, Velasquez finds opportunities to better himself. "In the Lesnar fight, I saw some technical stuff I can improve on - some stuff with my feet," he says. "When he rushed right away and we kind of got into that brawl, I should've relaxed a lot more in that moment. I took that lesson away from that win." While the prolonged UFC championship runs of Anderson Silva and Georges St. Pierre may seem to suggest otherwise, holding on to UFC titles is quite the challenge. For instance, the past five UFC 205-pound champions have combined to successfully defend the belt just once. And in the 18-year history of the UFC, the promotion's heavyweight championship has never been defended more than twice consecutively by any title-holder. But somehow, some way, Velasquez seems more prepared than most to defend his strap. Sure, Dos Santos provides an excellent challenger. And yes, should Strikeforce's talented roster soon make their way to the UFC, an entirely new crop of challengers awaits. But Velasquez's God-given abilities, coupled with an unmatched drive for success, would seem the perfect base from which to launch an unmatched run in the UFC's heavyweight division. Velasquez doesn't want to look too far ahead, but he certainly has similar goals in mind. "Right now, I'm just taking it one fight at a time," he concedes. "I'm going to try and keep this belt as long as I can, and that's really the focus. I want to keep this belt. I also want to keep getting better in the sport. That's pretty much it. I just want to keep my belt and keep evolving. "Just watching the fights while I've been off, I see how the sport is always evolving. You definitely have to keep up with that, keep staying hungry when you go to the gym, keep wanting to learn; all that is really important. You have to want to keep getting better." Once upon a time, Velasquez had his shot at a title trounced when Shane Carwin was pulled from a planned match-up with Velasquez in favor of a championship fight with Lesnar. Velasquez instead faced Ben Rothwell, and his title shot was delayed until this past October. However, in that 12-month span, Velasquez' game continued to improve, and he's now widely considered among the top pound-for-pound fighters in the sport and appears primed for an impressive title run. The injuries have healed. The doctors are no longer standing in the way. Velasquez, long tagged as "the next big thing" by industry insiders, now has his chance to shine. For the humble yet confident Velasquez, it's just as he envisioned his career. "I always had in my head that I would have my chance," reveals Velasquez. "I knew that when my time came, I would take advantage of it." UFC heavyweight champion Cain Velasquez would like to thank his fans, who have consistently offered messages of support during his lengthy recovery from surgery. In addition, he also gives credit to Zinkin Entertainment and Sports Management CEO DeWayne Zinkin, as well as his teammates at American Kickboxing Academy and his longtime strength-and-conditioning coach, Joe Grosso. 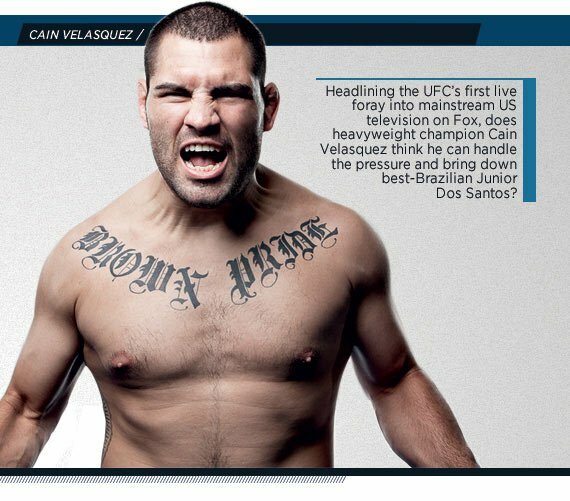 Fans hoping to keep up with the latest Velasquez news can follow him on Twitter at twitter.com/cainmma. "Josh is a great fighter. He's one of the most well-rounded heavyweights with great submissions and a great stand-up, too. Plus he's got a lot of experience. I think he was a rightful favorite in the Strikeforce tournament, along with my teammate, Daniel Cormier." "I had barely started preparing for Shane when he was pulled to fight Brock Lesnar. I still think it's an intriguing fight. He poses a lot of threats because he has a lot of power, and has pretty good wrestling as well." "Frank's a very big guy who is also very strong. I think he's recently improved his game, as well, especially in the stand-up area. He's getting more-well-rounded now and is dangerous against anyone." "I think Alistair is definitely one of the best out there. He's been one of the best kickboxers out there, and he's got a lot of MMA experience, as well. I'd like to fight him down the road, but obviously all of my focus is on Junior Dos Santos right now." "I don't think a person's size alone can cause too many issues, but Antonio is also very athletic for his size. He's got good stand-up and good power on the feet. But he's also very good on the ground, as well. He's one of those guys who provides a tough challenge everywhere in the fight." "Fabricio is definitely a top guy in the division. He's got excellent jiu-jitsu. There are a lot of great fighters in the heavyweight division, bus his submissions make him very dangerous. I think he would provide a tough fight."